Question: Are you impartial? Does Laoconnection.com receive money from advertisers, governments or grants? Answer: At the moment, the only revenue generation for the blog is made from the Google ads that appear on the main blog. The only other money that's used for the site is my own personal money, out of my own pocket. The blog is a labor of love. Luckily, I have a day job that pays decent though. So when a post about a book, website, video, blog, magazine, internet personality, a company, a charity organization or anything else for that matter, goes up on our site we are NOT receiving any type of compensation for doing that. In other words, we're not being paid to promote them so yes we're very impartial. At the same time, we've posted material on topics that might be controversial or reviews on books that weren't always positive, for example. Being impartial means dishing out both the good and bad and we try to do that in a constructive manner. 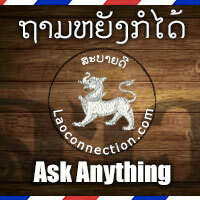 Having said that, helping to promote other Lao related projects, organizations, products, and individuals is a part of what Laoconnection.com is about. In that way, I'm admittedly more partial to posts that are positive rather than negative. Does that mean I'm no longer impartial? I don't think so and readers can decide for themselves.